با توجه به اهمیت و سهم عمده صادرات کالاهای صنعتی در سبد صادرات غیرنفتی و تأثیر آن‌ها بر رشد اقتصادی متوازن کشور، بررسی اثر سرمایه انسانی بر صادرات کالاهای صنعتی به منظور توسعه این بخش ضروری به نظر می‌رسد. هدف این مطالعه، بررسی تأثیر سرمایه انسانی و دیگر متغیرهای تأثیرگذار بر صادرات کالاهای صنعتی در سطح استان‌های کشور با استفاده از داده‌های تابلویی طی دوره (1386-1379) است. یافته‌های تجربی تحقیق نشان می‌دهد که طی دوره مورد بررسی، سرمایه انسانی در کنار ارزش افزوده صنعتی و نرخ ارز اسمی تأثیر مثبت و معنی‌دار بر صادرات صنعتی استان‌های کشور داشته است. همچنین، تأثیر تقاضای داخلی کالاهای صنعتی و متغیر رابطه مبادله نیز بر صادرات صنعتی استان‌های کشور منفی و معنی‌دار بوده است. توصیه‌ مهم سیاستی این مطالعه آن است که دولت برای توسعه صادرات صنعتی کشور باید توسعه کمی و کیفی سرمایه انسانی را در اولویت برنامه‌های توسعه خود قرار داده و با برنامه‌ریزی مناسب آموزش نیروی کار را بهبود و گسترش دهد. With regard to the significance and high proportion of Iranian manufacturing industries' export in non_oil export basket and their impact on balanced economic growth in Iran, it is essential that effective factors on the manufacturing industries' export be investigated. This paper investigates the impact of human capital on the export of Iranian industries, using a panel data set of 2-digit ISIC manufacturing industries at Iranian provinces level, over the period 2000-2007. For that purpose, we use the number of workers with higher education degree (as a proxy for human capital) to examine the effect of human capital on the export of the manufacturing industries. The results show that human capital, manufacturing value added and nominal exchange rate have positive and significant effects on the export of the manufacturing industries. In addition, the domestic demand of manufacturing goods and terms of trade have significant negative effects on these industries export. Therefore, any effort to expand the higher education is highly recommended. پورعبادالهان کویچ، محسن؛ اصغر‌پور، حسین؛ فلاحی، فیروز؛ عبدی، حسن؛ «نقش سرمایه انسانی در صادرات زیربخش‌های صنعتی محصولات شیمیایی و فلزات اساسی ایران»، مجله سیاست‌گذاری اقتصادی، 1388، شماره 2. 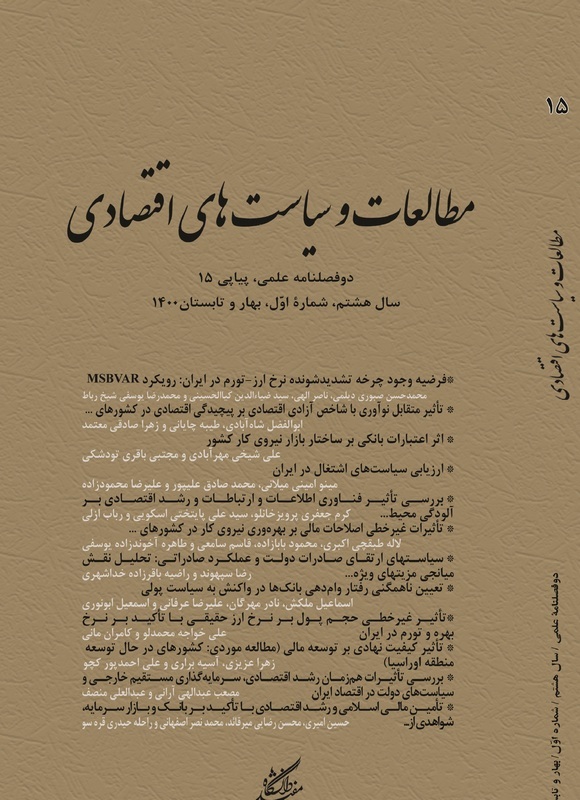 تقوی، مهدی؛ محمدی، حسین؛ (1385)، «تأثیر سرمایه انسانی بر رشد اقتصادی در ایران»، پژوهش‌های اقتصادی ایران، 1385، شماره 3. سند راهبرد توسعه صنعتی کشور، وزارت صنایع و معادن، 1385. سوری، علی؛ نادر مهرگان، نادر؛ «نقش سرمایه اجتماعی در تشکیل سرمایه انسانی»، فصل‌نامه پژوهش‌نامه بازرگانی، 1386، شماره 42. شاکری، عباس؛ «عوامل تعیین‌کننده صادرات غیرنفتی ایران»،فصل‌نامه پژوهش‌های اقتصادی، 1383، شماره 21. صالحی، محمد جواد؛ «اثرات سرمایه انسانی بر رشد اقتصادی ایران»، فصل‌نامه پژوهش و برنامه‌ریزی در آموزش عالی، 1381، شماره 24 و 23. طیبی، کمیل؛ اربابیان، شیرین؛ «اثر بلند‌مدت و کوتاه‌مدت آموزش عالی بر عرضه صادرات صنعتی ایران»، فصل‌نامه پژوهش‌های اقتصادی ایران، 1382، شماره 16. طیبی، کمیل؛ عمادزاده، مصطفی؛ اربابیان، شیرین؛ «اثرات ارتقاء آموزش عالی بر عرضه صادرات صنعتی در ایران (1378-1345)»، مجله تحقیقات اقتصادی، 1383، شماره 64. فتحی، سعید؛ عزیزی، شهریار؛ «بررسی تأثیر کسب و کار الکترونیکی بر توسعه صادرات: شناسایی اولویت‌های بخش صنعت در کشور»، پژوهش‌نامه بازرگانی، 1386، شماره 45. کازرونی، علیرضا؛ «نظریه‌های تجارت بین‌الملل»، انتشارات نور علم، همدان، چاپ اول، 1386. کازرونی، علیرضا؛ فشاری، مجید؛ «تأثیر شاخص‌های رقابتی قیمتی و غیرقیمتی بر صادرات زیربخش‌های صنعتی ایران (1382-1377)»، فصل‌نامه بررسی‌های اقتصادی، 1387، شماره 1. کریمی، فرزاد؛ پیراسته، حسین؛ (1383)، «ارزیابی و تحلیل تأثیرات متقابل بهره‌وری نیروی انسانی، هزینه‌های تولید و صادرات کالاهای صنعتی در ایران (1378-1373)»، مجله تحقیقات اقتصادی، 1383، شماره 65. مرکز آمار ایران (1385-1379)، نتایج آمارگیری از کارگاه‌های صنعتی ده نفر کارکن و بیشتر، سایت مرکز آمار ایران. ولدخانی، عباس؛ «عوامل تعیین‌کننده صادرات غیرنفتی در ایران با استفاده از روش‌های همگرایی انگل - گرنجر و یوهانسن (1374-1338)»، مجله برنامه و بودجه، 1376، شماره 23 و 22. Alvarez, R; "Determinants of Firm Export Performance in Less Developed Country", Estudies de Economia, vol. 29, 2002. Arora, A; S. D Bagde; Human Capital and the Indian Software Industry, 2006. http:// www. Druid. Dk/ conferences/ view paper. Php? Id=789&cf=8. Aysan, F. A; Y. Selim; "Investigation in to the Determinants of Turkish Export-Boom in the 2000", Journal of International Trade and Diplomacy, vol. 2, 2007. Baltagi, B; Econometrics Analysis of Panel Data, Third Edition, John Wily and sons Ltd, USA, 2005. Bleany, M; K. Wakelin; "Sectoral and Firm-Specific Determinants of Export Performance: Evidence from the United Kingdom", Centre for Research on Globalization and Labor Markets Research Paper, 1999, No. 99/12. Chuang, Y.C; Human Capital, Exports and Economic Growth: A Causality Analysis for Taiwan (1952-1995), Review of International Economics, vol. 8, 2000. Egert, B; A. Morales; "Exchange Rate Regimes", Foreign Exchange Rate Volatility and Export Performance in Central and Eastern Europe: Just another Blur Project?, BOFIT Discussion Papers, 2005. Gerdne, Therese; The Importance of Human Capital in Export Performance, Jonkoping International Business School, Jonkoping University, 2005. Isaksson, Anders; the Importance of Human Capital for the Trade-Growth Link, Statistics and Information Networks Branch of UNIDO, 2000. Hertog, J. F. D; E. Huizenga; The Knowledge Enterprise, Imperial College Press, 2000. Konya, L; "Exports and Growth: Granger Causality Analysis on OECD Countries a Panel Data Approach", Economic Modeling, vol. 23, 2006. Levin, A; L. Raut; "Complementarities between Exports and Human Capital in Economic Growth: Evidence from the Semi-industrialized Countries",Economic Development and Cultural Change, vol. 46, 1997, No. 1. Lutz. J.M; R.T Green; "The Product Life Cycle and Export Position of the United States", Journal of International Business Studies, vol. 14, 1983, No. 3. Michealy, M; "Exports and Growth, an Empirical Investigation", Journal of Development Economics, vol. 4, 1997. Munch, R.J; R.J Skaksen; "Human Capital and Wage in Exporting Firms", Journal of International Economics, vol. 75, 2008. Porter, E.M; the Competitive Advantage of National, Adeline Publishing Company Chicago, New York, 1990. Reyes, P.M; D.R. Osborn; M. Sensier; "Modeling Real Exchange Rate Effects on Output Performance in Latin America", Center for Growth & Business Cycle Research, The University of Manchester, 2004, No. 035. Rodwell, J.J; S.T.T Teo; "The Need to Accumulate Human Capital across Levels of Export Intensity: Activating Resources that are Increasingly Difficult to Mobilize",Research and Practice in Human Resource Management, vol. 11, 2003, No. 2. Ronning, J; M. Kearney; Graduate Prospects in a Changing Society, UNESCO Publishing, Belgium, 1998. Sarpong, Daniel; Susana Wolf; "Export Performance and Investment Behavior of Firms in Ghana", A paper Presented at the ISSER/Cornell University Conference on Ghana's Economy at the Half Century, 2004. Soderbom, M; "What Drives Manufacturing Exports in Africa? Evidence from Ghana, Kenya and Zimbabwe", CSAE-UNIDO Working Paper, 2000, No. 2. Tariq Majeed, M; E. Ahmad; Determinants of Export in Developing Countries, The Pakistan Review, vol. 45, 2006, No. 4. Teixeira A. C; N. Fortuna; Human Capital, Trade and Long-run Productivity, Testing the Technological absorption Hypothesis for the Portuges Economy (1960-2001), CEMPRE, Faculdade de economia, 2004. Van Dijk, M; "The Determinants of Export Performance in Developing Countries: The Case of Indonesian Manufacturing",Eindhoven Centre for Innovation Studies Working Paper, 2002, 02/01. Vernon, R; International Trade in the Product Cycle, Quarterly Journal of Economics, vol. 80, 1966, No. 2. Vogiatzoglou, K, "Determinants of Export Specialization in ICT Products: A Cross Analysis", International Network for Economic Research Working Paper, 2009. No. 3. Wignaraja, Ganeshan, "Firm size, Technological Capabilities and Market-oriented Policies in Mauritius", Oxford Development Studies, vol. 30, 2002, No. 1. Wood, A. and K. Berge, "Exporting Manufactures: Human Resources, Natural Resources and Trade Policy", The Journal of Development Studies, vol. 34, 1997, No. 1. Zeufack, A; "Export Performance in Africa and Asia`s Manufacturing: Evidence from Firm-Level Data", Journal of African Economies, vol. 10, 2002, No. 3.